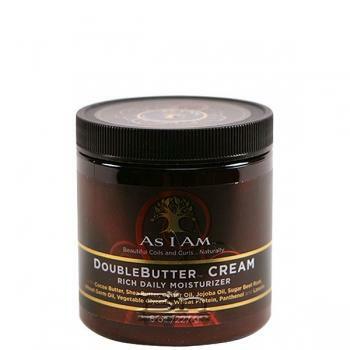 As I Am Double Butter Cream Rich Daily Moisturizer A power-packed natural moisturizing Butter Cream. Moisture is essential for great natural coils and curls. When your hair feels a bit rough and dry, and looks that way too, this is the jar to reach for. The power-packed As I AmÂ® DoubleButterÂ® Cream is a rich emollient blend, graced with the finest array of natural butters and organic oils. It gets the job done.